Healthcare management is a burning issue at the moment and this timely and topical book explores the ethical issues that arise in the context of healthcare management. Among the topics discussed are healthcare rationing, including an exposition and defence of the Qaly criterion of healthcare rationing and an examination of the contribution that ethical theory can make to the rationing debate, an analysis of how managers can be preoccupied with the goals of management and the values of doctors simultaneously, an outline of potential guidelines towards formulating a cohesion of healthcare management and ethical management and a reassessment of the role of healthcare professionals. 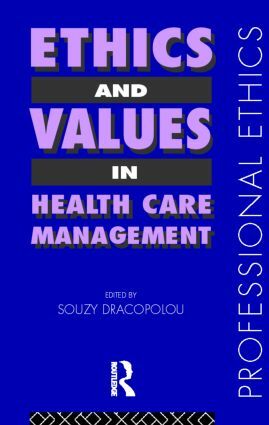 Ethics and Values in Healthcare Management provides a valuable and much needed analysis of the ethical problems associated with healthcare management and offers some solutions towards ameliorationg healthcare organisations.